Hi all. 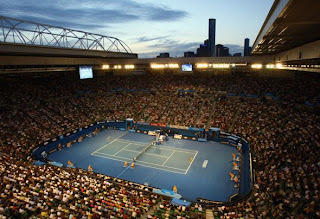 With the women's singles final starting shortly, here's today's place for discussing the tennis at Melbourne Park. This will be Dinara Safina's second Grand Slam singles final, and Serena Williams' thirteenth. After today, the winner will be number one in the world. History suggests that it will be Williams who lifts the trophy today - she leads the head-to-head 5-1, and Safina's only victory of the series was their sole match to date on clay. Good luck to both players. Enjoy today's final, and please keep this post focused on tennis until it's over.